Scientists at the Kepler Space Observatory have discovered a "super-compact solar system" in which five planets are orbiting around their parent star at a distance at least 12 times closer than the Earth's distance to the sun. 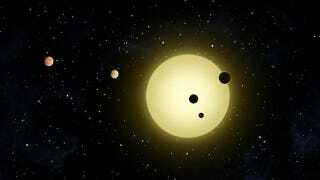 They're calling it the most crowded planetary system yet discovered. As reported in Space, the star in question is called KOI-500. It's 1,100 light years away and is about three-quarters the size of our own sun (though it has roughly the same mass). But what makes this star system particularly unique is that it hosts five planets that range in size from 1.3 to 2.6 times the size of Earth — and they all inhabit a tight area of space that is 150 times smaller in area than Earth's orbit. These planets are so close to their parent star that their annual orbits are only 1.0, 3.1, 4.6, 7.1, and 9.5 days long. And they're so close to each other that their gravity is pulling and pushing on each planet's orbit. Yet somehow the whole structure remains stable. And what's really cool about all of this is that the outer four planets follow a synchronized orbit that has never been seen before, what's being called a four-body resonance: Every 191 days these four planets return to an identical orientation. The researchers, a team led by Darin Ragozzine, detailed their findings yesterday (Oct. 15) at the annual meeting of the American Astronomical Society's Division for Planetary Sciences in Reno, Nevada. Top image: NASA/Tim Pyle. Inset image: Illustration by Karl Tate / Space.com.